I’m one of those who searches for depth in my relationship to nature. I avoid “attractions” that draw crowds, I often seek meaning for my interactions, and I strive to understand the how’s and why’s of what I see. I can mosey the same wooded path every morning for a month and each day be rewarded with a different gift. Among our ties to nature, spring is an overused metaphor for rebirth and awakening. Ask people what spring means to them and most respond with the obvious: warming days, or color and flowers. Further details tend to get sketchy. The pace and gadgetry of modern living seem to shorten our attention spans and numb our senses, so it becomes natural to gravitate to the obvious and skip over the fine print. An early spring palette of greens. 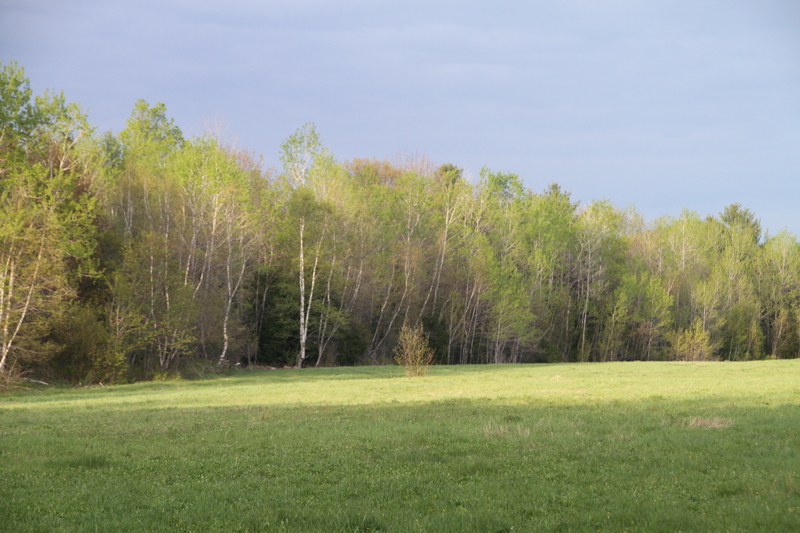 It’s easy to look at a forest from a distance in its’ entirety. We can do that superficially from the “outside” without even having to dip our toes into the pool of nature. It’s a small extra step to focus on individual trees in our yards or along roads as we drive by. It can downright cut against our grain, though, to make the quantum leap to being able to zoom in on an individual leaf. With each successive level of magnification of the microscope, we need to devote more of our attention span, put aside more of the clutter of our daily lives, and immerse ourselves a bit deeper into nature. Nature rewards those who make the effort, whether it be with health and exercise, healing, calming, food, or insight. Slowing down our pace and peering into the bursting bud of an awakening plant to look at a new leaf is on par with peeking deep within ones soul at mysteries that hint simultaneously of complexity and simplicity. 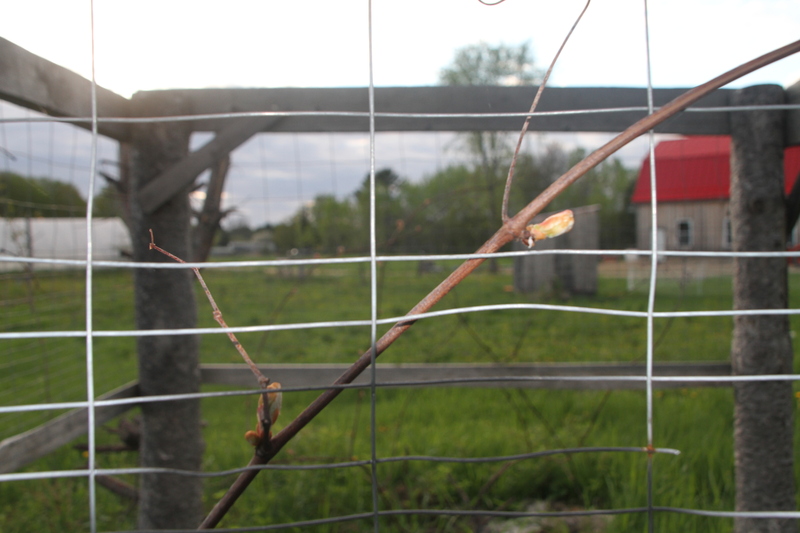 A Grape vine, buds close but one of the last plants to burst, hangs on by last years’ tendrils. Emerson spoke of nature as a path to self. 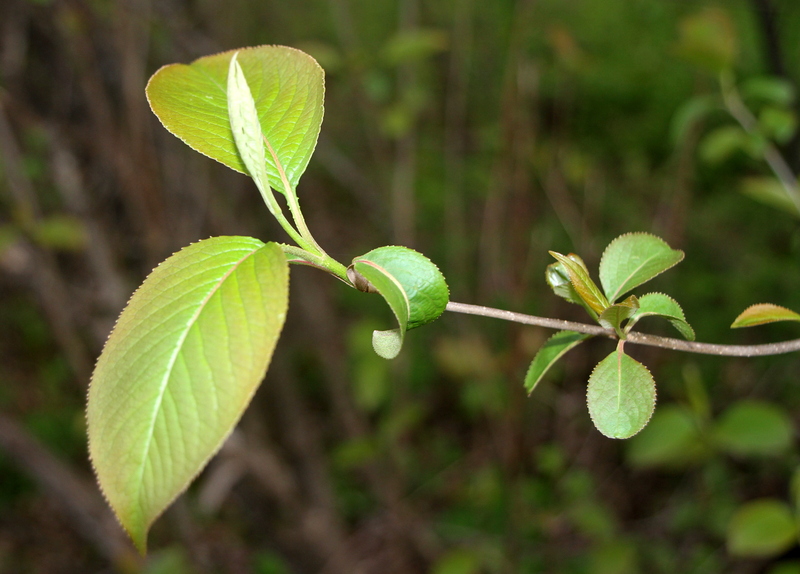 I’m certain there must be a reason I was drawn to look beyond the broad spring brushstrokes of warming days and greening landscapes, to focus up close on “bud burst” and new leaves. 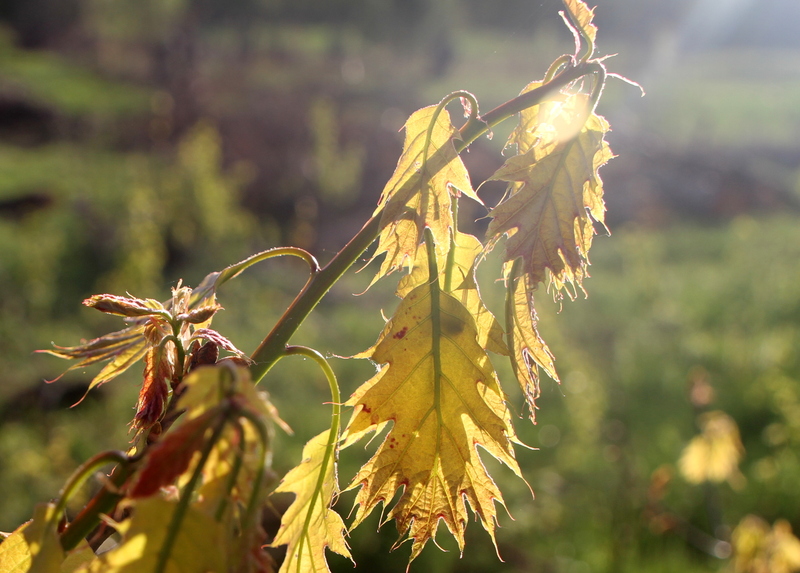 Today, though, I choose not to seek personal meaning and instead engage with wonder and awe something simple that I usually take for granted….new leaves! It was a wonderful early spring in Maine this year, with warm days and cold nights, more than our share of sunshine, and a drawn-out leaf out. 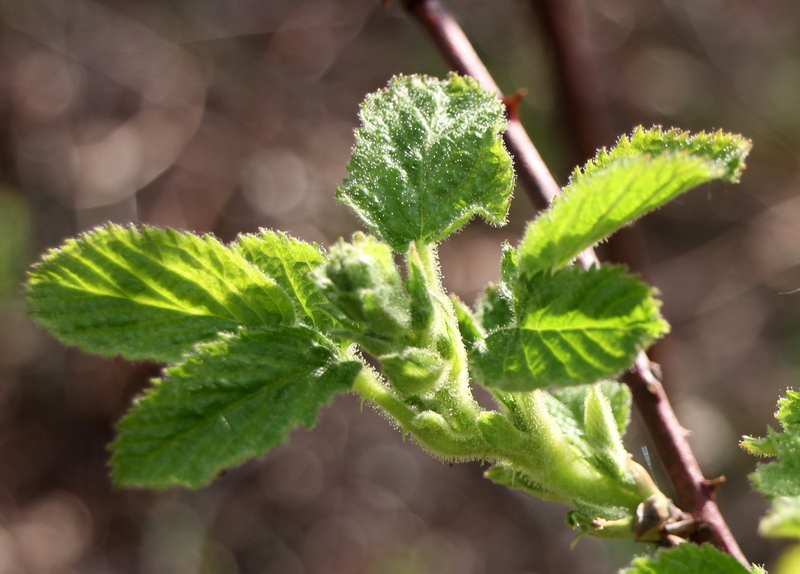 The buds were like paws on paper tigers, as they swelled early and threatened action, but they held leaves as claws retracted. Trees symbolize strength and grounding, and they store huge amounts of energy and resources in their fibers that’s readily tapped when the time is right. In many years, it seems like a switch is flicked and leaves appear over a single weekend. This year, though, leaf out seemed like it took a month. For me, it was a required amount of patience from the plant kingdom as it took me weeks to finally put aside my list of things I “had to do,” grab my camera, and take a snails’ pace walk through the woods. 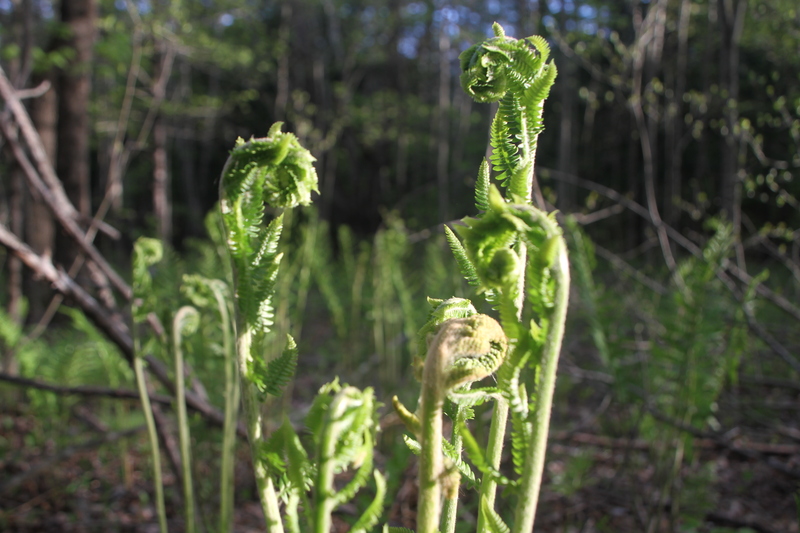 A fern choir singing in unison. The second half of spring and the early summer in New England has turned unendingly cloudy and rainy. The rich early spring pallete of green hues in forests – so many different shades of green that it reminds me more of a colorful fall – has blended into a more uniform forest green. So, before the memory of spring has faded and fall is upon us, I invite you to join me for the simple appreciation I had when I took my slow meander through a cliché – a spring awakening. 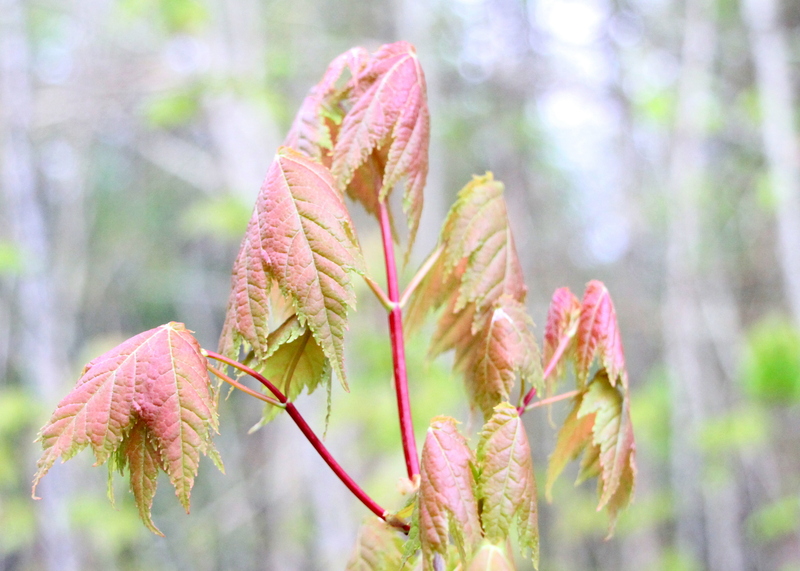 Enter nature, and pause for a close and unhurried look at new leaves. Like a conductors’ wand, this new beech twig seems poised to lead the symphony. 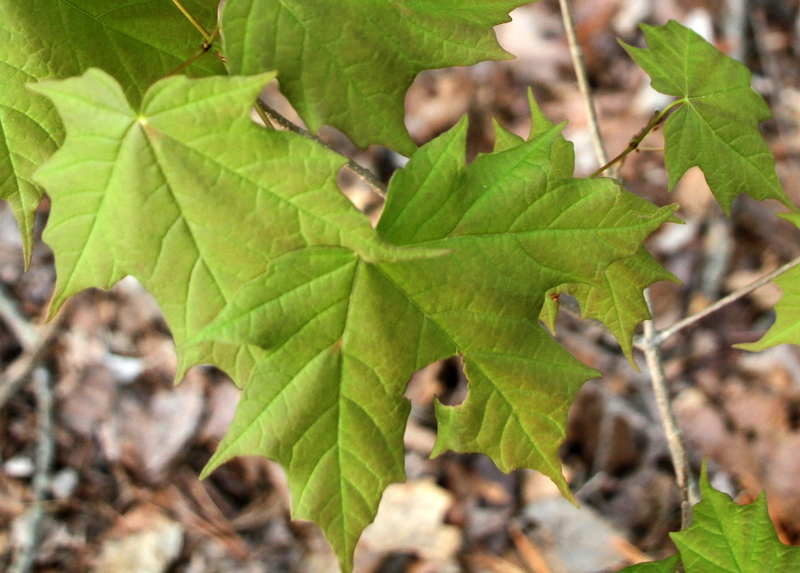 When leaves first open, they’re often translucent, veins are bared, edges are sharp, and surfaces buffed. The folds and creases they relied on to pack themselves into buds are still obvious. They’re vulnerable to hard frosts and they seem to advertise their fragility, but the promise of their coming abundance and sense of purpose is clear. 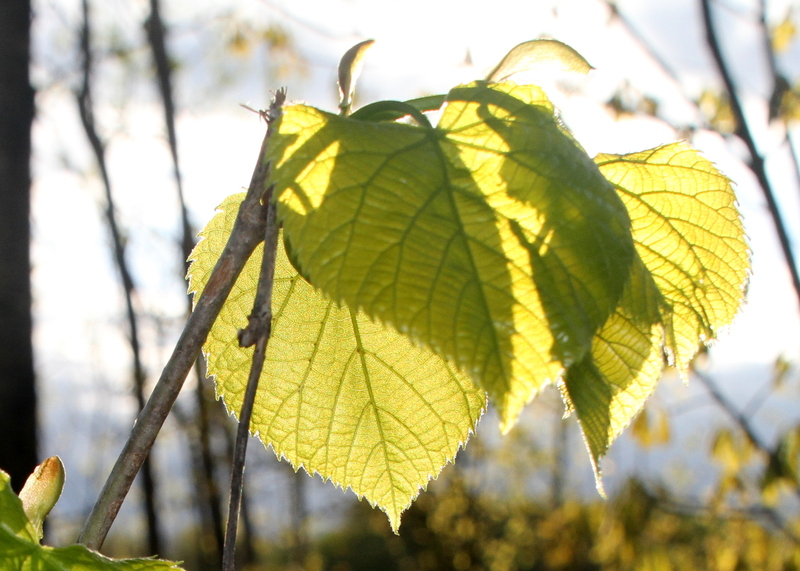 Basswood leaves, just remembering their color in the sun. 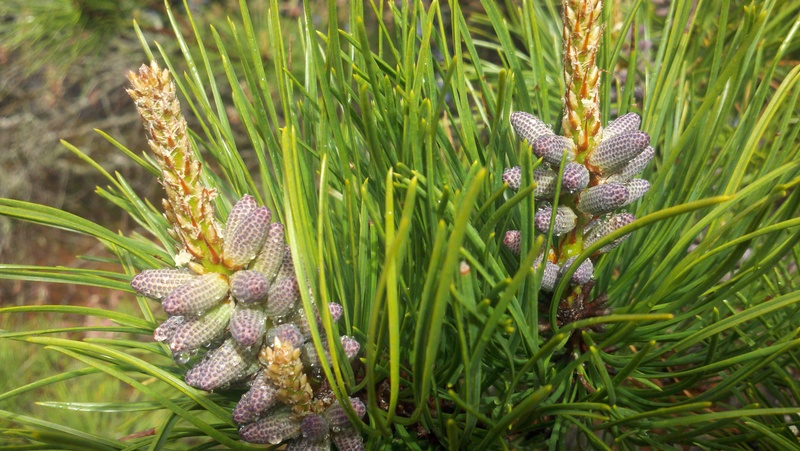 The rockets of a pitch pine poised for take-off. The serrated edges of new Nannyberry leaves seem like they could cut a tomato. 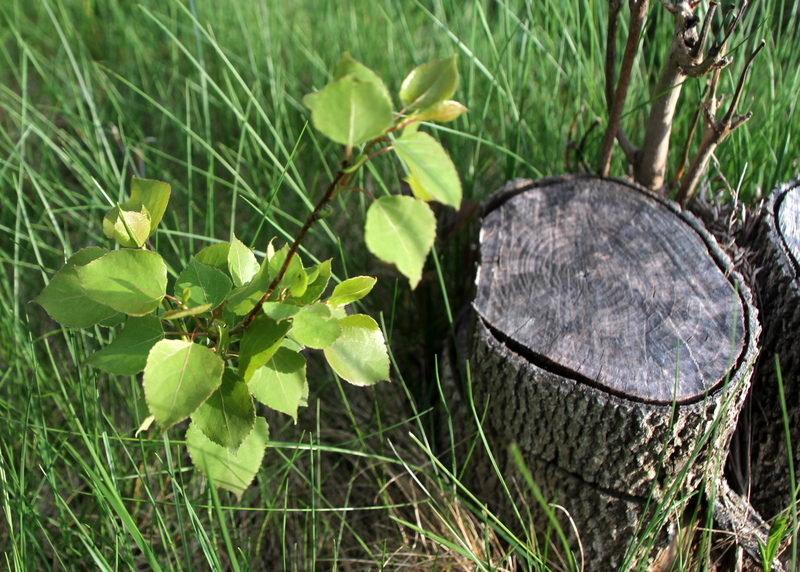 The new beginning for a Trembling Aspen tree, cut a month before. Maple leaves, not wanting to brag. 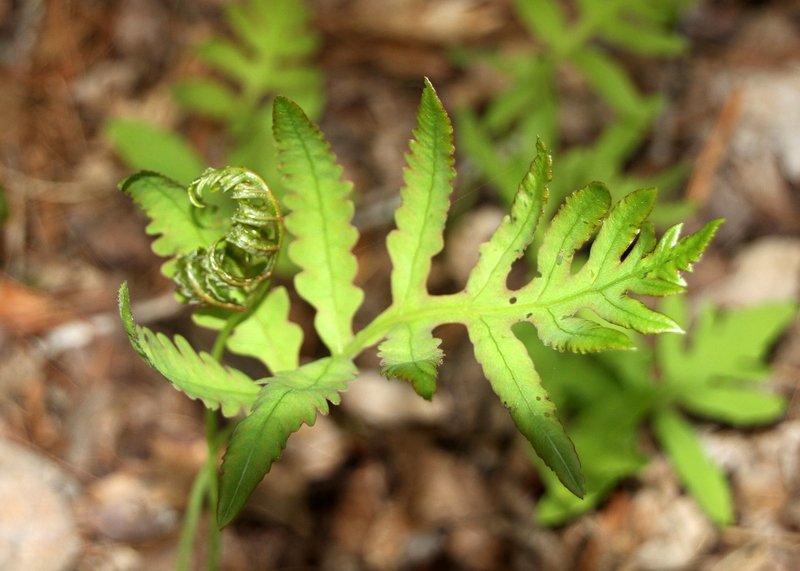 A Sensitive Fern displaying its sensitivity. “In our part of the country, spring passes quickly. If you haven’t been out for five days, you find the trees in bud. If you don’t see the trees for another five days, you discover that they’ve put out leaves. In another five days, they’re so green you wouldn’t recognize them. It makes you wonder: Can these be the same trees I saw a few days before? And you answer yourself: Of course they are. That’s how fast spring goes by. You can almost see it. From far away it comes racing toward you. And when it reaches you it whispers in your ear, ‘I’m here,’ and then runs swiftly on. Hinting at the onslaught it will face all season, a days-old Maple leaf already with an insect bite. We have much to gain from interacting with nature, but nature also has a lot to gain in the deal. Those who venture into nature tend to understand and appreciate it more, and become more sensitive to the many risks it faces. Who knows what a northeastern spring will look like in 100 years. Already, climate change is causing spring to arrive earlier in New England. With the weather of Boston being forecast to be more like Atlanta, it’s likely that making maple syrup will be a thing of the past. 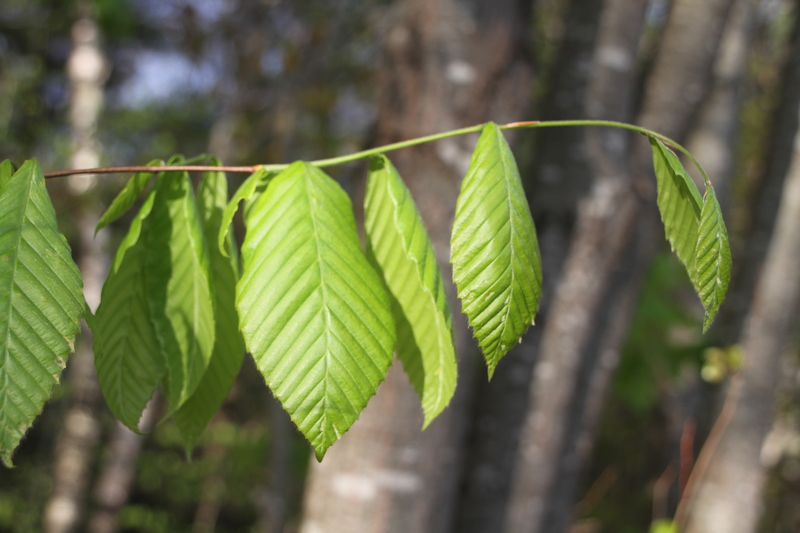 Our hardwood trees are under an unending assault from insect pests, diseases, and invasive plants. 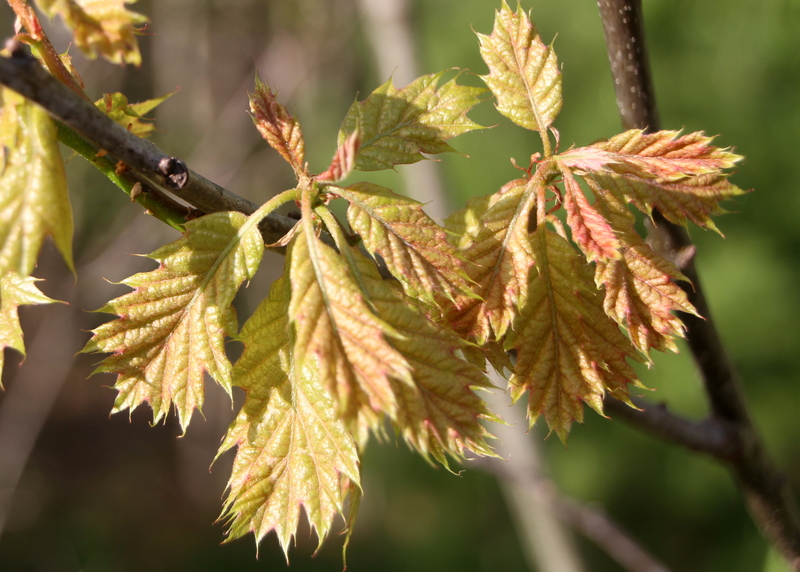 Chestnuts, elm and beech have mostly disappeared, and now maples and ashes are facing crises. Knowledge is the first step to action. Lovely pictures, great article. The tallest fern in the fern choir has a face like Nicholas Cage.